Cycling nowadays does not only limit to students and children who love the act of physical exercise. The level of popularity has extended to all the grown ups too. How about cycling all the way to work? How about cycling all the way to a shopping centre? Sounds interesting, isn’t it? Well, cycling is the new gym for all those who love to be on point when it comes to health matters. In order to encourage the practice of cycling, a proper place to store bikes play an important role in it. Sometimes the love for cycling gets detangled due to lack of proper bike parkings. Here is where a bike storage locker comes to the rescue. This serves to be the perfect platform where you can buy the trust of all those who wish to commute on their bikes. Be it a school, organization or a healthcare centre; storage solutions have always been one of the definitive priorities. This list of priorities have now one more storage option- the bike storage locker. Yes, bike storage lockers are slowly becoming one of the hottest trends in town. Let me take you through some of the advantages of why you should invest in a bike storage locker. Read on to find out about them. Cycling to work, school, colleges and shopping centre is indeed one of the best and healthiest mode of transport. To encourage this mode of commute it becomes equally important to provide a proper parking or rather storage facility for bikes. When the commuters are convinced that their bikes are under safe custody they feel more encouraged to use this mode of transport. Students and employees would immensely benefit from commuting on their respective bikes. Physical and mental fitness are the two major advantages that people commuting in cycle can be thankful for. A proper storage facility would encourage this healthy practice for times to come. Whether it is a school or a university or an organization, parking spaces have become mandatory to make it easy for people who commute in their respective vehicles. A good parking space has become one of the important amenity that every employee, student and or a customer would love to put their interest in. 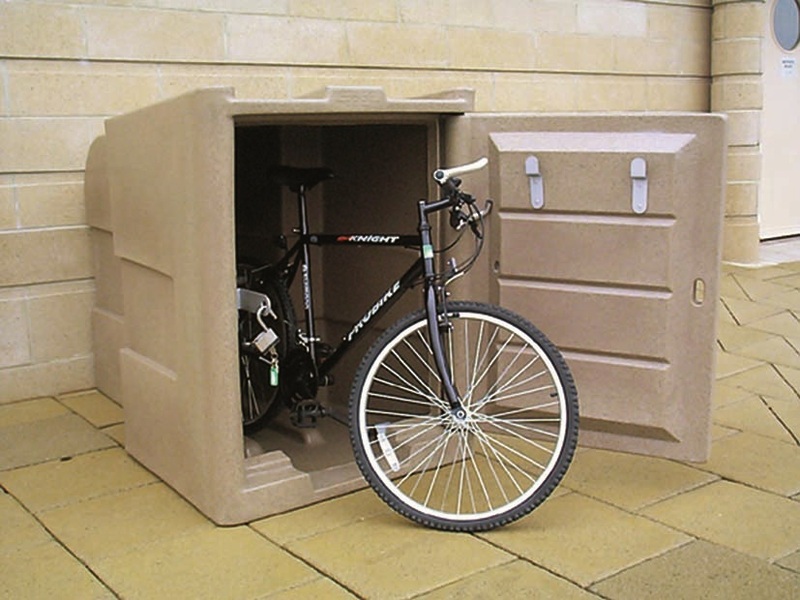 When it comes to providing a bike storage locker it is comparatively cheaper than other parking facilities. If it is the cost that is troubling you then you can very well buy in bulk to save on your expenses. However, these lockers will be worth the investments. Safety and security is yet another important set of factors that needs proper care and attention. Having said this, we understand the best of both worlds in town. A bike locker would nullify the fear of bikes getting stolen as they get a safe and secure environment to be stored. A bike locker has an inbuilt lock system that allows only the owner to have an access to the bike. Eventually adding up to the level of security. This would greatly impact the decision for commuting on bikes. Dirt and pollution are a part and parcel of our daily lives. When bikes are parked in the open they are prone to getting soiled or covered in dust particles. This greatly affects the quality of bikes being eroded over a period of time. Moreover, this also makes it necessary for the owner to clean it over and over until it is ready to be used. Providing a storage locker considerably cuts down their maintenance time along with protecting the bikes from dirt and other dust particles. Storage bike lockers play an important role in protecting the bikes from being tampered or vandalised. There might arise a situation where a commuter’s bike comes in contact with an angry mob and they leave no stone unturned in vandalising the property. In order to avoid such a situation it always proves to be fruitful in storing them inside a locker. When you have the bike lockers neatly arranged in a row you ultimately encourage the commuters to place their bikes in the lockers. This greatly helps in creating and bringing about a sense of discipline. A lack of proper place not only prohibits an employee or a student to travel on their bikes but could also cause indiscipline in terms of parking. Beautiful and convenient parking spaces too play an important role in uplifting an organization’s image. When you have a proper bike locker in the premises, you not only make it easy for your commuters but also add to your image. How about going for a locker with the company’s logo on it? You can give a personalized look to the entire surroundings, uplifting the infrastructural glory. A bike locker would indeed be one of the most cherished investments that an organization or an institute could ever make. With a proper storage facility for bikes, you not only encourage this healthy form of transport but would also bring in parking discipline. So, what are you waiting for? Go ahead and invest in the bike lockers and give the best mode of transport its very own safe abode. This entry was posted on Saturday, March 31st, 2018 at 8:01 am	and is filed under Bicycle Bike Storage Locker. You can follow any comments to this entry through the RSS 2.0 feed. You can leave a comment, or trackback from your own site.